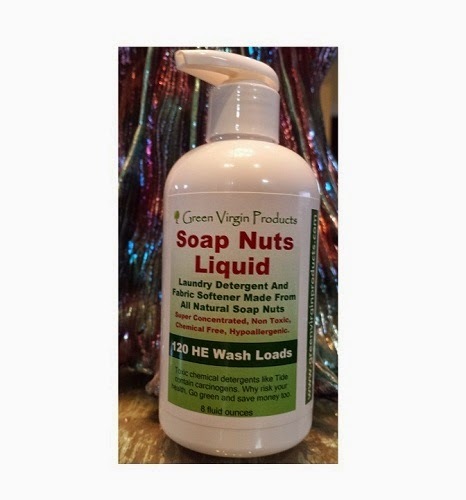 I recently had discussion regarding the impressive efficacy of a laundry detergent made from soap nuts by Green Virgin Products. The folks behind this revolutionary detergent have gone to great lengths to produce a natural product that offers a long shelf life without incorporating any harmful preservatives. This should be of interest to everyone, considering that commercial laundry detergent contains some rather toxic chemicals, many of which do not even require disclosure on labels, yet they're present and can pose a threat to our family's health as well as the environment. Part of the discussion I had was in regards to why inferior and harmful ingredients flood everyday products. The answer is simple, it's cheaper. So big business ensures a hefty profit. There is a light at the end of the tunnel, that is we as consumers can seek out safe options. As I mentioned at the opening of this post, Green Virgin Products; a family-run business, has taken great strides to produce a safe, effective and certified organic product. By utilizing the soap nut; aka soapberry, found in nature, which contains a natural surfactant. They have also successfully met the challenge of finding a safe, non-toxic preservative which was needed due to soap nut's short shelf life. They even went the extra mile in the production and manufacturing process to guarantee a better quality and more effective product. How does Soap Nuts Laundry Detergent compare to the leading commercial brands in price and efficacy? I really put this to the test. I wasn't kidding around with the large load of dirty and smelly laundry. I'm very impressed with the results and I feel I can safely say that this all-natural, organic detergent outperformed a top commercial brand. The price is very competitive, since I have an HE washer the small bottle of highly concentrated detergent is more cost-effective than the leading commercial brands, which is surprising to me since those commercial brands don't offer quality of product. Even if you don't have an HE washer, it's still more affordable. An 8 ounce bottle contains 120 average wash loads for an HE washer, so that would be around 80 wash loads for standard washing machines. You would have to have a pretty good coupon for the average commercial brand of laundry detergent to match the value of Soap Nuts Liquid detergent. The more important question: how does it compare to "natural" detergents such as Seventh Generation or Method? Better on both counts. Well, if it's more economical than those commercial brands then we know it's a far better value than Seventh Generation and Method. Soap Nuts Detergent is one of the few products I've encountered that offered a high level of quality at an very affordable price. There simply isn't any need to pay more. This means there is no need for anyone to risk our family's safety for a sake of a bargain. I'm really digging that this is a more natural alternative to the other laundry soaps on the market. We are trying to switch to more eco friendly products in our house! I have tried Soap Nuts and they are great! I love having an eco-friendly option to cleaning. I like that even though it is all-natural and organic it out performs commercial brands. What isn't to like! I like that a little product goes a long way. I love the lightweight aspect - good for the disabled. I really like that this comes in liquid form.I have seen the actual soap nuts offered before.I love the more natural products in my house. I like that you can use just a little of this product. My son would appreciate this because he has to walk to a laundromat and doesn't want to carry a lot of products with him. I prefer organic laundry detergent but usually cannot afford it. I am getting ready to try one. I like that it's so concentrated. It won't take up much room. I hate all those chemically detergents out there - some of them give me contact dermatitis. I always opt for the fragrance free, dye free, etc ones, but going all natural sounds even better! I love that this is a liquid! The only soap nuts I have ever seen were just that, nuts! I have not tryed the soap nuts yet, this is the first time I've heard of it and am looking forward to trying it out. It's nice that this offers an alternative to the typical chemical-filled detergents. I mean I don't exactly find myself losing sleep over chemicals in detergent, but this product is preferable. I've been wanting to try soap nuts. Love that this compares in quality and price to brands like seventh generation. I've started using natural items for cleaning whenever I can. I've used a homemade laundry soap before but it seemed more toxic than the store-bought ones! I'd love to try this. I like that it's economical and all natural. I would love to try this product. It is new to me. Nice comments about your product. I love that this product is safe, all natural, and that I can use it to wash my son's cloth diapers too. It's affordable! I love that's its natural. Love that! I'm working on deleting everything toxin out of my life. I like that an 8 oz bottle will wash 80 loads of laundry. I also like that there are no dangerous chemicals. I like that it doesn't have any chemicals in it. I love that this product is in liquid form and eco-friendly and organic; there are no strings attached and it outperforms major commercial brands. I'd love to try this! I haven't tried this, but I'd love to...it's definitely a better option. Toxic chemicals scare me and they make me mad because they don't have to be in our products so why are they?! I love the idea that it is natural, that they have found a soap nut from nature - I hate that no matter how I try to remove artificial products from my life it will probably never be possible. It's annoying how harmful chemicals are everywhere. I'd love to try this as an alternative! Toxic chemicals in so many things is not good. I try to buy green products as much as possible. I don't like toxic chemicals in detergent, especially when I'm doing my kids laundry. The more natural, the better! I went to the web site and read some more on it, I love how small it is but still able to do 120 loads wow, love the fact that it uses a pump, more more messes with spilling or putting to much in, I really would love to win this product, sounds like the perfect soap to me!!!! I like how a little bit goes a long way. I have not tried soap nuts. I like that it doesn't have any harmful chemicals. I have a four year old with very sensitive skin, so we are very reluctant to expose him to chemical cleaners. I like that it can be used in both types of washing machines. I have a regular machine where my daughter can only use HE Washing Machine products. It sounds like it smells a heck of a lot better than my laundry detergent, that's for sure! I love the idea of being chemical free. I tend to get hives on my skin so I'm careful about which products I choose. I have always been nervous about trying soap not from the store. Guess I should try it as all things change. I have always wanted to try these, the review is great -and makes them sound even better! I love that they have no chemicals. I like that it is compact and easy to transport and store. I'm much more worried about chemicals now that I have a baby, so that's definitely something I watch out for now. I have been wanting to try more organic cleaning products and esp laundry soap. I feel sure that many of the chemicals that are in the conventional products are not healthy and probably cause rashes for many people and even worse. I would really like to try this product. I like that its eco friendly,and don`t contain any harmful chemicals!! I am always very weary of harsh chemicals in my laundry detergent. It makes me feel like I am a walking toxin and am always looking for more natural ways to clean my clothes, and myself. We are trying to switch to more eco friendly products in our house! I'm really digging that this is a more natural alternative to the other laundry soaps on the market. I like that it is a liquid-I have used the soap nuts that go into a little bag to use.. I love that it is organic and very low on price. I do a lot of laundry and could use this to try. I try to avoid nasty chemicals in laundry detergent. I love the idea of avoiding chemicals in everything my family uses, & I would love to try this as it seems reasonably priced! We have our own well & septic tank so have to be very careful not to disturb the natural bacterial action in the sewage system. Because of this & the fact that our family is sensitive to most biological detergents I've tried most eco-products. This is a new one to me and would I'd welcome the opportunity to try it out. I often hear people say the like the scent of regular detergents but I find them rather overpowering and I figure if you can still smell perfumes (which have to be chemicals) when you've rinsed then those chemicals must still be on the clothing. Doesn't sound good to me at all. I have to avoid chemicals in laundry products because I've noticed they trigger asthma in me. I only use natural products now. I think these natural laundry products look great! Chemicals are already in pretty much everything these days and I think it's really important to try and avoid chemicals in laundry products because these chemicals go into our clothes and then get absorbed in our skin. It is very important for me to avoid harsh chemical detergents for my family. Our skin takes in so much, it is very important to protect it has much as we can. I'll have to try this kind. I'm so sick of all the chemicals in our daily household products. I think their wrecking havoc on our health more than we realize. I have tried similar brands of laundry detergent but haven't been satisfied. I try to use friendly products because of my septic system & I have to be careful of scents for my allergy's. I have heard of this brand ( from another reviewer) but haven't seen it in any stores in my area. I think anything we can use without chemical interference is great, plus the low cost makes this a win win. I like that its organic and concentrated. This is really cool, I didn't realize this was made in liquid form. I have been wanting to try soap nuts for a long time. Soap nut is a natural product which contains a natural surfactant. It doesn't contain anything harmful and its very safe for use. This is what I like about the Soap Nuts Concentrated Liquid Laundry Detergent. To avoid chemicals in my detergent, I sometimes make my own! I'd be so interested in trying an "organic" detergent. I like using natural laundry soap, my daughter is allergic to any scented soaps. I am so glad to find that they are available to use. have heard of this product but have never tried it so thanks for chance! I'm concerned about toxic chemicals in my laundry because I don't want those chemicals transferred to my skin via my clothing. I really don't like those chemically detergents out there, natural is the way to go! I like having no chemicals to prevent allergic reactions. I hate the fact that so many detergents out there are full of chemicals. it makes it hard to find one that doesn't cause a rash for my baby. I would love to try something like soap nuts.. I LOVE THAT ITS CONSITRATED , IT WILL SAVE ME MONEY. I've heard tons of great things about soap nuts. I do wonder how they'll do for handwashing. I hope I get to try soon! I love that it's a liquid all natural and organic. I like that its non toxic,also that such a small bottle can do so many loads, what a money saver. I like that it's natural and a little bit goes a long way. I love that its better for the environment and will create less waste with the smaller packaging. Teresa S- I like that its concentrated and you shouldnt have to use alot of it to get your things clean. I hate the thought of toxins in my washing, and I feel guilty! I'd love an alterntive. I would love to try this, I don't like the toxic chemicals in laundry detergent. I like using soap nuts to do laundry. It's natural and economical . I have not tried soap nuts but would love to. I feel that an all-natural, organic detergent is very important to reduce the toxins that we can be exposed to. Having three children under the age of 5 I am very particular about what laundry products I do use because of the hazardous chemicals in detergents and especially dryer sheets. Hearing that there is a functional alternative really makes a big deal in my realm of laundry. I have pretty sensitive skin, and I"m pretty sure that sodium lauryl sulphate is a big trigger for the itches. I love that this detergent doesn't have any! I love that I don't have to worry about funky chemicals ending up in my laundry or going down the drain. I am trying to become more ecofriendly with all the products I use, so it would be cool to try this! I like that it is all natural... my daughter and I have sensitive skin so this is good because any chemicals in our laundry soap tend to make us break out. I much prefer using cleaning products that are natural and have few, if any, chemicals added. I've used soap nuts in the past and like it very much. I have not tried soap nuts before. I like that it doesn't have any harmful chemicals since my daughter is very sensitive to detergents. I like that you can use just a little of this product. I like that Soap Nuts are USDA Certified Organic and wild crafted. I am also impressed that they work in hot, warm or cold temperatures. Who would want toxic chemicals in anything? I have always wondered about "soap nuts". The first time I heard of them, I thought *they* were nuts! I love the idea of using a product without perfumes or dyes. I like that the product is HE so I can use it in my front loading washer. I also like that I only have to use a small amount so I'm not lugging large bottles of detergent home from the store and it cuts down on plastic waste. I love products that are safe to use. I really like that this is all natural. Our everyday like is awash (no pun intended) with man-made chemicals, so any product that has less potential toxic exposure is a positive development, especially for kids.